Involuntary Smiles: Que Dia es Hoy? I know I just asked you that a few short days ago, but today happens to be an awesome day! It is the day a tiny Mexican army defeated a huge French army that hadn't been defeated on more than 50 years. It is a day to celebrate the culture and heritage of the Mexican people. But do you remember how I have said (on many different occasions) give me a reason to celebrate, and I will do it? Well, this here is a great reason to celebrate, and by gum, celebrate we will. 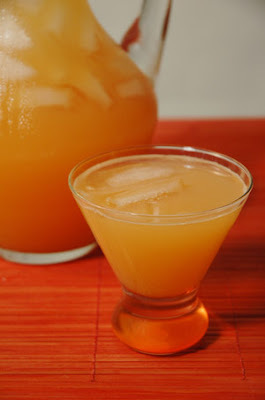 For the festivities today we are going to have a delicious agua de melon which is one of my all time favorite drinks. Basically you get a cantaloupe, blend it up, sieve it (if you want) into a pitcher full of sugar and water, and enjoy it. I have some fresh mint growing in my back yard, I think I will use that as a garnish. Chips and salsa (of course) and some sort of Mexican dish. I am thinking tostadas with crema and queso fresco on top with a side of frijoles. I am also thinking of making some chocoflan for dessert. Or, we could be classic, and just have fruit sprinkled with chili powder. We are not doing a pinata, since I didn't get one put together before now, but we will be dancing, and partying it up all night long! Yay! So I subbed for a spanish class today so naturally, I learned more about Cinco de Mayo. Now I'm off to activity days and I'm going to incorporate it into our lesson/activity. It'll be great! Hope your partyin' is awesome! ohhh, that drink sounds so yummy! what a fun party you have planned, hope you guys have a great time. I want to come! I love love tostadas! Have fun celebrating! Thank you. I wish you could come and celebrate with us, but... I understand. 100,000 miles does make it a little difficult. How fun for you! I actually just learned a little about the history of this great day from wikipedia. That's great that you can share it with your activity day girls. The drink is beyond yummy, it is divine! I will post the recipe on my recipe blog, if you would like to hop on over and check it out. Obviously everything is according to taste, but... it is so soothing, it is like a spa party for your mouth. i know it is short notice, but if you really want to come, come on over! The more the merrier! lime and salt on your fruit? That sounds interesting. I think mango anything is wonderful. I am going to have to try it. Thanks! I remember in Elementary school we would celebrate Cinco De Mayo. It was my favorite day. The whole school would be earning pesos for being good for a month before the actual day. And then day of we would all bring things to sell and we would buy them with our pesos. Oh so fun!! I love a reason to celebrate too! I make any excuse to turn a day into a national holiday.